Happy Monday, Everyone! Today I want to share with you a feature wall my brother and his wife recently installed in their basement. Would you like to see their amazing reclaimed wood accent wall? Come on over! A few years ago my brother’s kitchen completely flooded ruining their kitchen. The water traveled down the stairs to their finished basement, ruining much of it as well. First things first, they replaced the entire kitchen and flooring on the main floor, then turned their attention to the basement. Most of the ceiling, carpeting and lighting had to be replaced in the basement. (Water is so destructive!) While they were at it, they decided to spruce it up a bit. They have 3 teenage-ish children and they like to hang out down there with friends. After all of the repair work and painting was complete, they added built in cabinets along the wall on each side of the fireplace. Surprisingly the white built ins make the basement look so much larger! The picture is a little dark, but you can see the tv rests over the gas fireplace and flanked by shelves, cabinets and window seats on each side. Even though this is a walk-out basement, the windows add much needed light. Here is a better shot of the built ins. I love how the crown molding caps off the tops of the shelves at ceiling height. Painted a crisp semi-gloss white? Classic. In addition the the built ins, they have a long blank wall in front of the staircase. They decided to fashion a DIY feature wall using authentic reclaimed wood. Shana, my sister in law, has a friend who told her about a man that lives about an hour outside of Troutman and sells vintage lumber. She told Shana, “be ready to dig”! And she spoke the truth! The gentleman took Shana and Edward down the street to a chicken house filled from floor to ceiling with wood, molding, staircases and all sorts of salvaged goodies. A treasure seekers paradise! Being a teacher, naturally Shana was interested in the history and story behind the wood. She learned the brown boards are from the 1830’s house of his great, great, grandfather and the tobacco gray boards are from the early 1900’s mountain house, both of which had been demolished. With measurements and color scheme in hand, they carefully chose pieces from both houses and came up with a colorful assortment of textures and sizes. Wisely they began by painting the entire wall black. This way any white in the cracks wouldn’t peek through. Using a stud finder, they identified the location of the studs and marked them vertically from floor to ceiling. Beginning at the bottom center, they began attaching each board to the wall with a nail gun into the studs. Shana said they simply eye-balled the wall to estimate the color and length of the next piece. Then cut the next piece, attached it and so on. Great job! Isn’t this truly a statement wall? From start to finish the project took them about a week to finish. They were working after my brother got home from work in the evenings thus it took a bit longer than if they’d had a solid block of time. Measure twice and cut once as they say! See how beautiful it looks finished? I mean, look at this gorgeous, rich wood! Great job, Edward and Shana! Photo credit also goes to Shana who kindly snapped these pictures and sent them to me so I could share with you. Air kisses! Wouldn’t it be fun to have such a bold feature wall in any home? Each board has it’s own unique patina and story. And this is a fun take on the ever-popular shiplap. Their basement is finally complete and nary a trace of the former water damage. In fact, the basement is even better now! If you are looking for a similar look and are not quite as handy with a nail gun or saw, you can achieve a knock off version via a peel and stick application from Amazon. 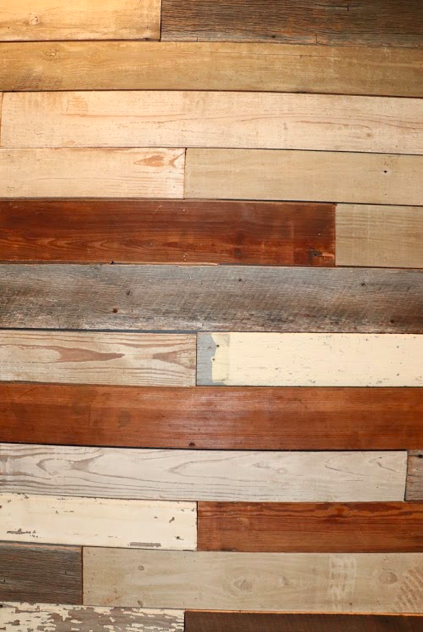 Simply search for peel and stick reclaimed barn wood wall and a variety of options come up. Pull-Out Drawers in the Pantry! !